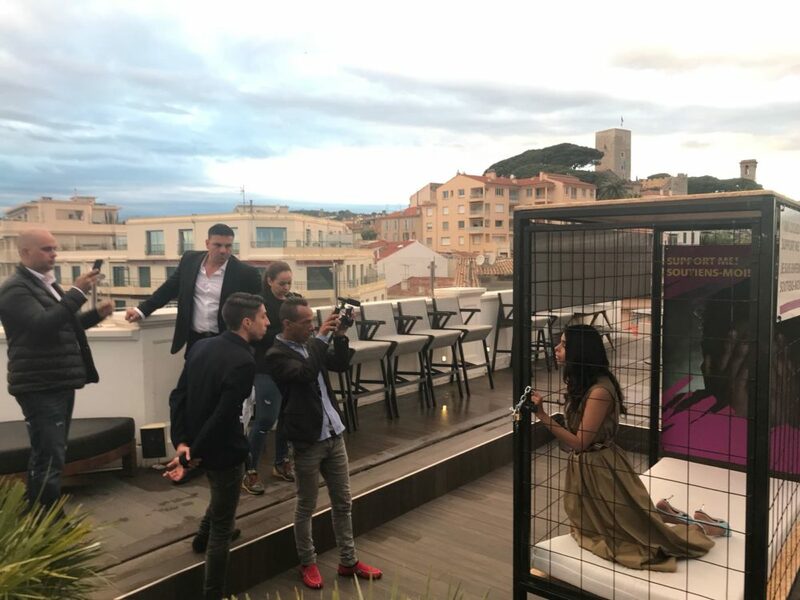 Actress and Free a Girl Ambassador, Mallika Sherawat, continues to raise her voice regarding the heinous crime of forced child prostitution, by joining Free a Girl’s Lock Me Up Campaign at the 71st Cannes Film Festival 2018, wherein Mallika was locked up in a small cage at the Radisson Blu, 14 May, to raise EUR 25,000 towards the liberation of minor girls from brothels in India. 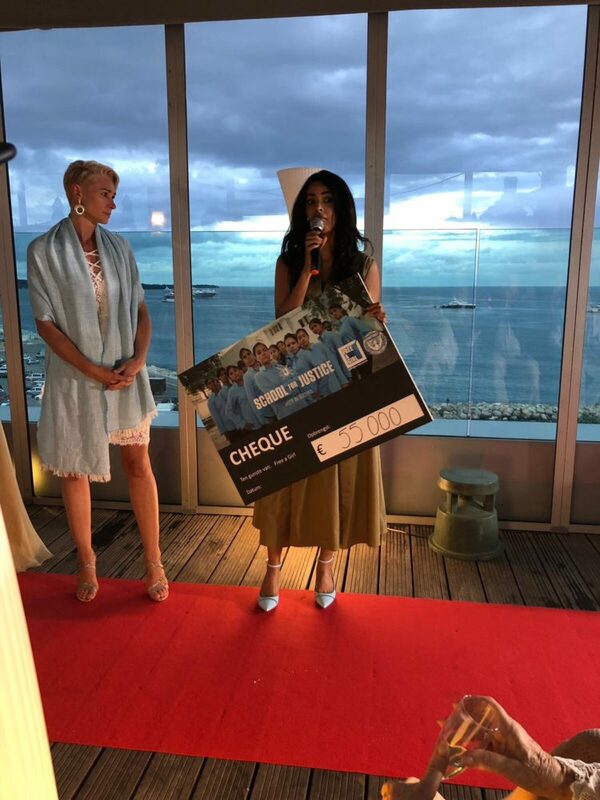 Soroptimist Bianca Leemkuil from the Netherlands, surprised Mallika with a cheque for €55.000, as a donation to the unique and progressive programme School for Justice, which was set up in Mumbai, India in 2017. Securing massive media attention around the world, the ground-breaking programme which rescues girls from child prostitution, educates and trains girls to become lawyers and prosecutors, and in doing so, affords them the power to prosecute the criminals that once owned them. The School for Justice programme is supported by a large number of clubs in the Netherlands, and reflects the vision and principles of Soroptimist International, and its mission to transform the lives and status of women and girls globally, through education, empowerment and enabling opportunities. 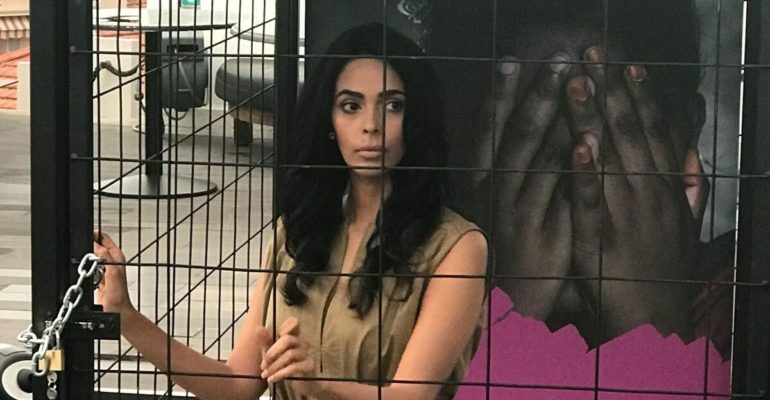 Photo: Photographers share the global message – Free a Girl Ambassador, Mallika Sherawat ‘Locked Up’ as part of campaign to raise awareness of the problem of child prostitution in India, and the impunity of the offenders. Free a Girl, is an international NGO, that fights against human trafficking and commercial sexual exploitation of children in India; firm in the belief that there is a need to change the conversation and mobilise society to act. Free a Girl India – an initiative of Free A Girl, is a coalition with partners Sanlaap, Freedom Firm, Transforming Lives Foundation, Equal Community Foundation and Odanadi, focuses on creating awareness about the problem of child prostitution and the impunity of the offenders; and to date, the organization has helped in the liberation of 4149 girls from brothels, as well as supporting the rehabilitation and reintegration of the girls back into society. The School for Justice was founded to break the cycle, so that child prostitution in India may become a problem of the past. The girls selected for the programme were freed from prostitution several years ago, and have gone through a process of trauma counselling, empowerment and education. The Lock Me Up Campaign is an initiative to raise public awareness of the plight of women and girls in India; with small cages placed in locations around the Netherlands, to symbolise those that exist in the brothels of India, where young girls are held captive, and forced into prostitution. Participants are locked up for 12 hours to create awareness about forced prostitution amongst minors and to raise as much money as possible. The more money collected, the more girls can be rescued from prostitution by the teams supported by Free a Girl. With this money Free a Girl can continue to suppport the rescue teams and expand operations to liberate even more girls. The money is also invested into prosecuting as many human traffickers as possible. Made up of 103 clubs, the Union of Soroptimistclubs in the Netherlands, Suriname and Curaçao, is part of the Soroptimist International network of over 75,000 club members in 122 countries.